Olearys Case — PinMeTo | Your customers are everywhere - are you? O'Learys, a global chain of sports restaurants with locations in 13 countries wanted to take control of its online presence and engage local fans. Not only did O’Learys understand the value of having all of their locations published on the largest social networks, maps, and search engines, they took things one step further and cultivated their local audiences with custom, relevant content. The results are staggering. O’Learys has seen steady month on month increases in almost every metric measured by PinMeTo. Today, O’Learys benefits from not only the increased exposure across networks, but they can be confident that when a customer searches for an O’Learys location they will always find properly branded content with everything they need to find their way to the restaurant. Since starting with PinMeTo, O’Learys has experienced month on month increases in views on Google and Google Maps. These increases include Google searches where “O’Learys” was searched for specifically (direct searches) as well as categoric searches such as “sports bar” or “pub near me” (indirect searches). While direct searches indicate how well known a brand is, indirect searches have a unique value in that they represent an undecided customer. In indirect searches companies have the chance to become the provider of choice, and take that opportunity from their competitors. Direct searches have increased by 75% from 145,985 to 254,747 each month. Indirect searches have increased by 33% from 430,046 to 572,331. See figure below for the full graph. O’Learys also saw a huge increase in Google Maps views. This is due in part to the fact that Google Maps results now show up even when the customer does a regular google search (See figure 2 below). O’Learys was found on Google Maps 1,921,803 times in the last month, an increase of 470% over the same time last year! In addition to the increase of views on search and maps, O’Learys also saw a steady increase in customers using the information they found to call their restaurants, get driving directions, or visit the local O’Learys web page. The monthly volume of customer actions in terms of calls, website visits, and requests for driving directions all essentially doubled. Monthly calls increased from 8,566 to 15,210, website visits increased from 18,243 to 35,601, and driving directions increased from 12,972 to 20,688. See figure below for the complete graph. Before O’Learys could build and capitalize on their local audience, they had to ensure that their customers found official O’Learys pages that they owned and administrated. To accomplish this, O’Learys removed 371 unofficial Facebook pages and moved 6,562 Likes and 225,981 check-ins to official pages (see figure 4 below). The O’Learys customers who had liked and checked-in on those pages were now properly connected to O’Learys instead of to unofficial pages that may have lacked information and branding. With the unofficial pages removed, O’Learys could concentrate on building and engaging their local audiences. They did this by consistently posting locally relevant content on their locations to increase visits and brand exposure. The results speak for themselves. In the last 28 days O’Learys locations have been viewed on Facebook 13,242,000 times and 10,800,000 of those views were unpaid (see figure below). O’Learys strategy of acting locally has also reaped benefits in terms of location “Likes” and Check-ins on Facebook. 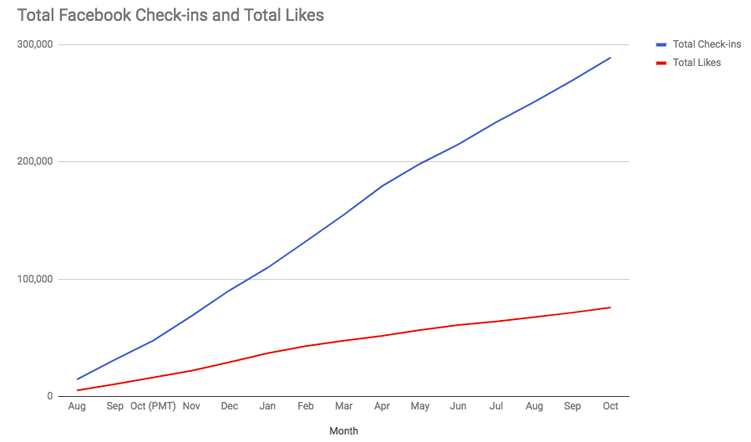 Over the last year, they have averaged 20,000 new check-ins per month, and have increased the number of “Likes” on locations to nearly 250,000 (see figure below). O’Learys made the decision to take control of their restaurants on Facebook, Foursquare, and Google and they have had steady increases in exposure ever since. Their decision to promote locations has created large and engaged audiences who help spread the O’Learys brand by sharing content, checking-in, and “liking” pages. Today O’Learys not only has much higher volumes of views across multiple networks, but they have the added satisfaction of knowing that those views are showing properly branded O’Learys content and have complete and up to date business information such as address, phone number and opening hours.